I’ve never been big on soup and I’ve always thought of it being a huge production to make. But once I started cooking up this delicious soup and realized how easy it is it became a regular dinner in the rotation. The white beans and turkey make it filling, flavorful, and great the next day. And if you follow my food posts you’ve probably noticed that I love kale in all forms. This recipe originally came from one of my clients and I’ve modified it to make it my own. It’s perfect for a weeknight when you want something hearty and clean that doesn’t require tons of time. Also, preparing the soup doesn’t make a major mess in the kitchen and all you need is one big pot! Once pot is hot add turkey, garlic, cayenne pepper, salt and pepper. Use spoon to break apart turkey. When turkey is almost fully cooked (not too pink), add bay leaves, carrots, onions, turnips, and cook for a few minutes. Add white beans, vegetable broth, water, and kale. Bring to a boil. Add any extra seasoning if necessary. I hope you enjoy this amazing soup as much as I do! Cheers to a new month and new week! The most common questions I get from clients and followers are about my diet so I figured I’d share what a typical day looks like for me. I’m obsessed with clean eating and I’m always trying to figure out ways to incorporate more nutrients into my daily diet. I love food and I’m constantly experimenting and learning what works best for my body. I focus on eating mostly vegetables (as much as possible), complex carbs, and lean meats like chicken and fish. I buy mostly organic, fresh, and local when possible. I stay far away from dairy, and because my guy has celiac disease, I rarely eat gluten. I’m not into diet trends or fads, just intuitive clean eating. I also believe in having sweet treats and a tequila on occasion without letting it ruin your life (it’s called balance but I’ll save that for another post). I stress the importance of nutrition with every one of my clients and I’m very honest about one thing: you cannot out exercise a bad diet. PERIOD. Even though most of my Instagram stories are of what’s on my plate, I’m going to give you a breakdown of a what I eat on an average day. I always start my day with either warm lemon water or a shot of apple cider vinegar, and I make sure to drink plenty of room temp water over the first two to three hours of my morning. Because I’m up very early, I feel my best when I spend the first few hours of my day hydrating before I eat anything or have any caffeine. Six months ago I decided to stop drinking coffee all together as an experiment to alleviate stomach issues. I noticed such a big difference that I completely quit coffee and haven’t had it since. I enjoy black tea, green tea, and matcha once or twice per day. True story: I wake up hungry every day. I’m a breakfast lover! If you’ve been following me for a while on the gram you know how much I love my morning oat bowls. Usually enjoyed on the go, this bowl of perfection is filled with 1/2 cup of gluten free oats, a scrambled egg, peanut butter powder, almond milk, berries, and some coconut or bee pollen sprinkled on top. My breakfast must be filling and tasty, and this bowl is my go-to! I’m a salad fanatic. I eat a big salad for lunch almost every day. My green of choice is either romaine, baby kale, curly kale, shredded brussels sprouts, or a mixture of two. For protein I use chicken (usually pre-made in the Crock Pot) and sometimes a hard boiled egg white. Cucumber and avocado (either 1/4 or 1/2) are a must. Other items that get thrown in if available are chopped green apple, butternut squash, bell pepper, orange, walnuts, onion, and chickpeas. For dressing I mix together EVOO, white wine vinegar, and Dijon mustard. A snack between lunch and dinner is a must for me. It usually happens between clients, after my workout, or anytime between 2 and 4. I am a huge fan of bars like FROPRO Bars (specifically the almond butter). Other snacks include nuts, hard boiled eggs, protein shakes, low sugar green juice, and a red apple with almond butter. Depending on my workout and how many hours I’m working, certain days I’ll feel the need for a snack between breakfast and lunch. I try my best to listen to my body when it comes to eating between meals. If I feel extra hungry one day I won’t ever deprive myself of a healthy snack. My boyfriend and I usually take turns with dinner. Luckily, he’s an amazing cook and we eat all the same foods. I try to have somewhat of an idea of meals I’d like to make ahead of time so I can buy ingredients in advance. We love to grill chicken, shrimp, and the occasional burger. Steamed vegetables, roasted potatoes, and baked salmon are weekly staples. I try to keep my dinner portions under control, eating mostly vegetables and protein. A perfect weeknight dinner would be a turkey burger, steamed broccoli, and cilantro cauliflower rice. Simple, tasty, and far from boring. I try my best to eat before 7:30pm allowing time to digest before bed. This way I wake up feeling energized and rested. A HUGE tip I would give to anyone would be to find things you like to eat for dinner that are also great for lunch the next day. Questions about healthy eating or need some diet guidance? Contact me for more information about personal training and diet coaching! Be sure to follow me on Instagram for daily meal ideas, motivation, and tips! The other day I had a 5 mile run planned and the thought of this salad was what got me to the finish line. Kale Quinoa Salad is one of my all time favorites. It’s hearty, tangy, and SO satisfying. I don’t typically eat quinoa for dinner since it’s higher in carbs, but since I had a late afternoon run this nutrient-packed salad was just what I needed for recovery. Place salmon on a large piece of foil on a baking pan. Pour 1 tbs olive oil, 1 tbs honey, and pepper over salmon. Fold sides of foil and wrap salmon so it’s fully covered. Bake for 20 minutes, then broil for 5. Place kale in a large bowl (removing stems) with chopped orange slices, avocado, quinoa, steamed butternut squash, and sliced almonds. Pour in dressing and mix up the salad. Remove salmon from the oven, leaving the honey mixture in the foil. Garnish with parsley and place salmon on top of salad. *I do not measure out kale or most greens. I like to eat as much green as I can! **Foods like quinoa and butternut squash usually make way more than one serving, so I like to eat the rest over the next two days with other meals. These days there are SO many options when it comes to meal delivery services. Vegan, Paleo, allergy-friendly, organic…you name it. Over the years I’ve had many clients who have tried most of the meal services in South Florida. A huge part of training with me is understanding how to keep a clean diet, so food is a major topic in most of my sessions. I guide my clients to be the best version of themselves by proper nutrition and exercise. Luckily, I love to cook and will always make the time for it in my schedule. But for someone with long work hours, a busy parent, or just someone needing help in the kitchen, a meal delivery service could be a savior. Recently I tried a few days of meals from Catered Fit, a Florida-based food delivery service. Setting up the account and choosing meals online ahead of time was super easy. I was given a few choices for breakfast, lunch, and dinner. I was also able to choose a meal plan which was dairy free (HUGE plus!). The meals were delivered in a cooler tote to my doorstep which was very convenient (I live in a building). All of the meals were really fresh and flavorful. I’m typically a creature of habit when it comes to food, but having these meals made me eat a few unfamiliar vegetables like Swiss chard and broccolini which I wouldn’t normally cook. If you follow me on Instagram you know that I’m a lunchtime salad LOVER. Two of the days I chose a salad for lunch and they were both awesome - arugula with salmon and shredded brussels sprouts with chicken. I was also able to make note of any food that I did NOT want to see in my meals, which for me happened to be mushrooms (yuck!). Overall, I was impressed by Catered Fit and would recommend them to anyone needing fresh, healthy, and convenient meals daily. Click here to read more about what Catered Fit has to offer. With a few of my regular morning clients away for the Holidays last week I actually got to eat breakfast at home for once (and not in the car!). But whether it’s on the go or at home with a cup of hot tea, I’m a BIG fan of breakfast. I’m one of those people who wakes up thinking about food. My day usually starts very early with a few clients back to back - so my morning meal has to be filling, energizing, and tasty. I put together this dreamy bowl that’s all of those things and more. First cook the oats on the stove with water. Cook for a few minutes until soft, then add raw egg white. Cook for another 4-5 minutes then move the oats into a bowl. Pour in almond mylk to taste and stir. (I love my oats creamy so I do a heavy pour…especially if it’s homemade!) Top with hemp shells, banana, coconut, cinnamon, and bee pollen. Enjoy! As I recently stated on my Instagram story, one of my goals this year is to make a habit of making my own almond mylk. It’s always been my favorite dairy substitute and I tend to use it often. But making your own is great simply because it’s PURE. No fillers, preservatives, added sugars, plastic, etc. The difference in taste and texture is crazy, and although it sounds kooky, you can feel a difference. The first couple times you DIY it’s a little messy, but once you get the hang of it it’s a smooth operation. Using a bowl or container, place the nut milk bag on top and slowly begin pouring the almond mixture. Allow the liquid to drain out then begin squeezing until there is just pulp left in the bag. Discard pulp, or save for future recipes. 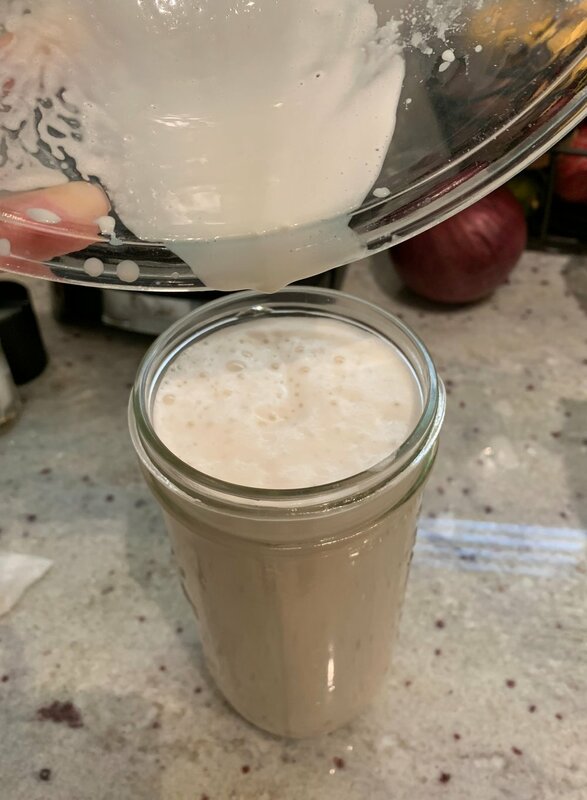 Transfer almond mylk into a jar or closed container and refrigerate. Will keep for a few days, but best when fresh! Remember to shake very well - separation is natural. **Recipe can easily be doubled. I double it and it lasts me 3 days if I use it daily in breakfast and in hot tea.